I'm all about the faux tan. A tanned complexion can be accomplished without the harmful UVA/UVB rays from the sun as well as tanning beds. Every time you tan and the skin darkens, it means that damage has been done to your skin. Extra precaution should be taken to avoid sunburns, because when you burn your skin is more vulnerable and sensitive to the rays. If you read Beauty vs. Health, it further explains how damaging tanning is. There are so many other alternatives from spray tans, mousse, lotions, and gels. There's an option for every body, tone, and skin type. Try something affordable at first if you're not sure. 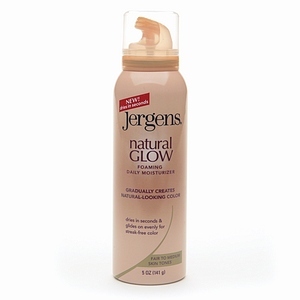 Jergens has a natural glow collection. I've been using their Revitalizing Daily Body and Facial Moisturizer ($8.49 each). In just a day or two of using it your skin starts to get a healthy glow. Another one of their products you can try is the Foaming Daily Moisturizer(Also $8.49 and an Allure magazine favorite). It comes in the form of mousse and makes it so much easier to tell where you've applied it on the body or not for a streak free finish.